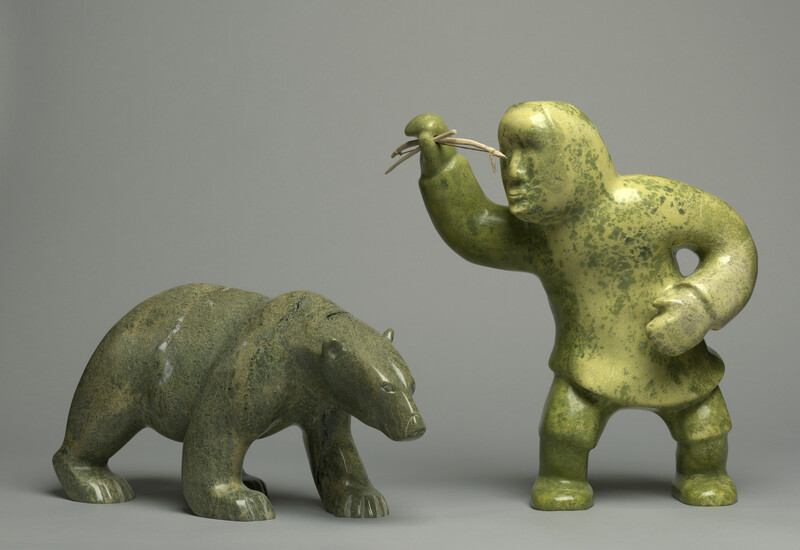 A two-part sculpture in mottled green serpentine of a polar bear and an Inuit hunter holding a bone bow and arrow in his raised right arm. Artist Pauloosie Tukpanie (b. 1960) of Iqaluit, Baffin Island, is known for his carvings of polar bears. In Canada, the Inuit have traditionally hunted polar bears as for their meat and hides, which provide warmth and also camouflage for hunting in the snow and on the ice. In Inuit tradition, the hunter shows the bear his weapons and the bear chooses whether to be killed that day, or to escape, hence the hunter's raised arm.